I hate bridges. Actually, I'm scared of them. I'm scared of walking across them, driving across them, or anything else that has to do with them. When I'm on a bridge, I start to panic about the possibility of falling off and drowning in the car that has submerged under the water. This fear, however, does not apply to my old friend, the Golden Gate Bridge. When I was nine years old, Christmas was spent with my cousins, my aunt and uncle, and my aunt and uncle from England. Before the holiday, however, I went to the Golden Gate Bridge with my dad, my brother, one of my cousins, and the England aunt and uncle. The first picture below is of my and my cousin, Melody (I'm on the right), and we're probably just catching up on the last few years because we've never been the cousins who see each other all the time. This particular catch up moment, however, is probably my least favorite. 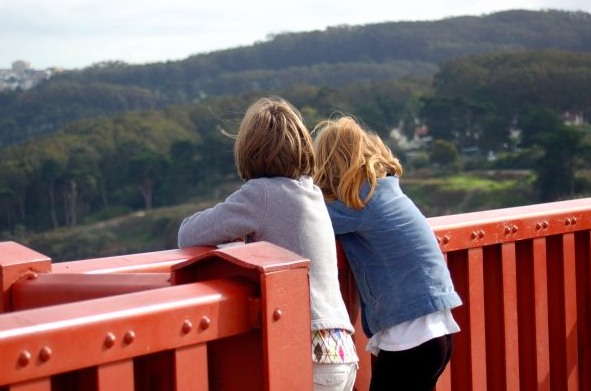 While walking along the Golden Gate Bridge, I remember telling her about my parents, how I was pretty sure they were going to get divorced someday, and how I wasn't necessarily worried but definitely wasn't happy about it, either. As we all walked across the bridge, I remember thinking about how life as I knew it was going to change, and I remember not knowing how to feel about it. The next time I visited the bridge was pretty similar. As I'd suspected, my parents were separated, but I'd come to realize a divorce was not far off. There are some really cute pictures of me and my brother from this trip across the bridge, but since I know he'd never forgive me if I posted them, we'll stick to the picture of me and my cousin. The point of me telling about this second trip is the same as the first: My melancholy, ten year old self was in a state of reflection. Something about the Golden Gate Bridge does that to me, I guess, and it always has. While at the bridge I thought about my family a little, but the thing I remember most about this visit is me thinking about my friends, or rather the lack of them. I had been at camp meeting with my dad, brother, and grandparents, and while there I had found a few kids my age who I'd been with the majority of the time, and I loved it. I knew, though, that when I went back to school all of that would change, and I really didn't want it to. Flash forward a few years, and I was living in Cupertino, which, on a good day, is only about an hour away from San Francisco. My parents had been divorced for about four years, I had moved to a different school and had a good ground of friends. 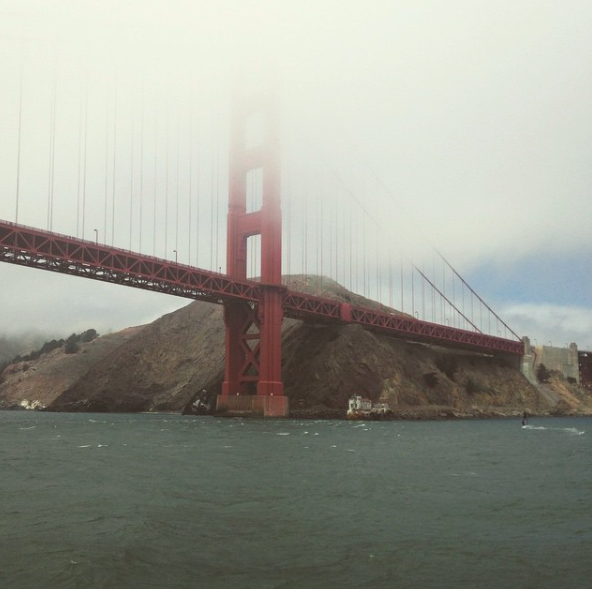 On this trip to the Golden Gate Bridge, my mom and I had actually taken one of those boat tours that pass under the bridge itself, and it was right before passing under that I took the picture below. The first two times I'd visited the bridge, I'd thought about the things in my life that I didn't like, mainly my family and lack of friends. This time, however, I distinctly remember thinking about all I had to be thankful for. As I wrote in an Instagram post that day, "...today, my heart was filled with peace, and I knew that even though life isn't always easy, I am happy with my family and my friends. I am happy with my house, and I am happy with my school. And I know that God had all of this planned out the last time I was at this bridge, praying for something good to happen." My time in Cupertino didn't end up being as perfect as my fifteen year old self so wanted it to be, but it certainly stood as a testament to time and all that it heals. The next time I visited the bridge was only four months and three days later, on my sixteenth birthday. I'll probably write a whole post someday about my sixteen birthday (and the Halloween that followed), but right now I'll only say the good parts of that day. Being at one of the places that had meant to much to me on my birthday somehow made it seem extra special. Since it was my birthday, I was already feeling reflective, and being by the Golden Gate Bridge just made me more so. I remember that I almost started crying because I was getting older. All of a sudden, I felt the pressure of being closer to twenty than to ten, but then remembered how I felt when I was ten years old and stood exactly where I stood then and realized that life was far better now than it was six years ago. My most recent journey to the Golden Gate Bridge was a couple weeks ago. I went with my mom, and as we walked across I felt myself grow quiet. The first time I stood on the bridge, my family was changing. This time, as I stood there looking out onto the water, I realized that my family is changing once again, only in a very different way. The second time I stood on the bridge, I was heartbroken over my lack of friendships, and this time I realized I have come out the other side of that. Probably not for forever, but right now I have strong friendships all over the place, and I couldn't be thankful enough for that. The third time I came to the bridge, I was just thankful for everything that happened in the past four years, and this time I once again felt that feeling of gratitude. The fourth time, I felt the pressure of growing up, and that was still true this past time. This is my last year of high school, my last year at home, my last year of all that has been familiar. My sixteen year old self was worried about turning twenty one day, and if only she could imagine what my present, eighteen year old self is feeling. Even so, there is something about this bridge that takes away all my fears. I'm afraid of bridges. I don't like them, and I avoid them whenever I can. Except for when it comes to the beautiful Golden Gate Bridge. This bridge, this place, reminds me of all that I've gone through in the past eighteen years. It reminds me of what life was like before my parents split up, what it was like right after, and what it's been like since. It reminds me of what it feels like to wander the playground by yourself because you don't have any real friendships, and yet it also reminds me of what it's like to have friends who want to take pictures with you on your sixteenth birthday (and also what it's like to have friends who will take care of you when you're sick and throw up all over the cabin floor. But again, the story of my sixteenth birthday is for another time). The Golden Gate Bridge reminds me of all I have overcome, and all I have to be thankful for. The bridge reminds me to take life one day at a time while still looking ahead to all the good things life will one day give me. Life hasn't always been easy, and I know that fact won't change as life goes on. But while life hasn't always been beautiful, it has always had beautiful moments. While I may still be afraid of bridges, this one in particular will always have a very special, bridge shaped space in my heart.